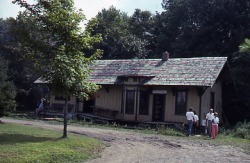 The Greentown Railroad Station circa 1878 from Aultman was dismantled and moved to the Century Village Museum in Geauga County in November 1967. To see the restored building and learn more about the Century Village Museum, click here. To learn more about the Railroad Station, click here to see a transcript of a 1967 Canton Repository article.